STAFF Cecil L. Brown / Publisher and Editor Clifford Brown / Advertising Director Emanuel V. Brown / Art Director Tmil Curtis / Nat’l Promotions Director Johnny Sanders / Nat'l Public Relations Dir. Departments RADIO PLAYLISTS ... 14 - 15 TOP 30 INDEPENDENT GOSPEL SONGS CHART ... 17 CALENDAR OF EVENTS ... 19 CLASSIFIED ADS ... 19 GOSPEL USA MAGAZINE is published quarterly by Gospel USA Magazine, P.O. Box 970704, Miami, FL 33197 USA. Telephone (305) 234-8689. All contents copyright 2019 by Gospel USA Magazine. All rights reserved. No cancellations or refunds for ads or orders after advertising deadline. By the submission of all materials (ads, copy, information, artwork, photos, music, etc. ), or payment for the same, the submitter of the material or payer for the same hereby confirms that he/she is legally authorized to possess, distribute and publicize the material into this publication without additional approval, and accepts all legal liability for doing so. For our complete advertising policies and rates, visit our website before placing ads. 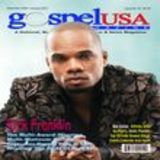 Mail subscriptions to Gospel USA Magazine are $15 per year (4 quarterly issues). International subscribers, call for rates. Send your name, complete address and a check or money order payable to Gospel USA Magazine, P.O. Box 970704, Miami, FL 33197. For credit cards orders, call us or visit our web site. n February 10th, 2019, a proclamation was issued and was officially recorded in the history books of Miami-Dade County, Florida. What was that proclamation? "Cecil Brown Day" was officially declared in Miami-Dade County! (See the document below). What does that mean? That means each year, everybody everywhere is supposed to take that day off from work and everyone everywhere is supposed to buy ME an expensive gift! (I'm just playin'). To subscribe, just fill out this form, detach and mail it along with payment to: Gospel USA Magazine, attn: Subscription Department, P.O. Box 970704, Miami, FL 33197. 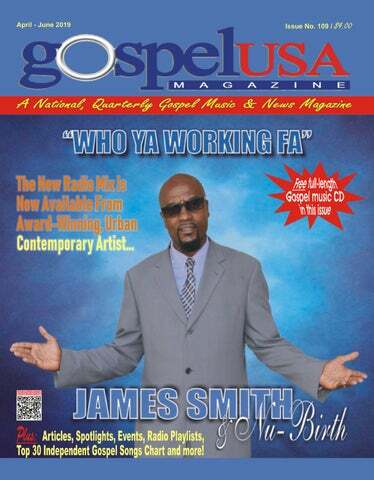 For credit card orders, visit www.gospelusamagazine.com or call us at 305-234-8689. This offer is good until 6/30/19 and may change without further notice after that date. Show your support for one of Gospel Musicâ&#x20AC;&#x2122;s most popular magazines! or more than 25 years, Kirk Franklin has been a trailblazer – writing, producing and performing uplifting music which is loved by Christian and secular audiences alike. His body of work has garnered 12 GRAMMY® Awards, 43 Stellar Awards, nine NAACP Image Awards, four Billboard Music Awards, three BET Awards and an American Music Award – among others. In January 2019, Franklin, released his new single, "Love Theory." "Love Theory" is available via all major digital providers and fans can watch the "Love Theory" music video anytime on the Kirk Franklin YouTube Channel. With an up-tempo R&B melody and classic Kirk Franklin lyrics, "Love Theory" will have listeners feeling inspired. Since the release of his last album, the GRAMMY® Award-winning Losing My Religion, in 2015, Franklin has been busy touring, cultivating talent through his record label, Fo Yo Soul Recordings, and collaborating with a diverse array of other artists including, Chance the Rapper, Kanye West, Ledisi, Mandisa, Marvin Sapp, Tamela Mann and Tori Kelly. Franklin also launched the Exodus Music & Arts Festival in partnership with Live Nation Urban in 2018 and he will host and headline that 2nd annual event on May 26, 2019 in Irving, TX. He will also host the 34th Annual Stellar Awards on March 29, 2019 in Las Vegas, NV. Visit www.kirkfranklin.com. ekalyn Carr – multi-award winning Gospel artist, speaker, author, and entrepreneur – is celebrating a rare feat. The talented individual has garnered the No. 1 spot on two national airplay charts simultaneously with the song, "It's Yours." "It's Yours" has become a favorite among listeners, touching hearts and impacting lives and that is reflected on the charts. Carr hit the No. 1 spot on the Billboard Gospel Airplay chart as well as the MEDIABASE Gospel chart. Overjoyed and thankful, Jekalyn comments: "I want to thank God for this testimony. I'm grateful to have another number one single off my latest album, One Nation Under God." The album was released in February 2018 and debuted at No. 1 on the Billboard Top Gospel Albums chart. In addition, the song "You Will Win" spent 5 weeks at No. 1 on the Billboard Gospel Airplay chart and Carr garnered a GMA Dove Award for Traditional Album of the Year for One Nation Under God. Currently, she is nominated for five Stellar Awards – Female Vocalist of the Year, Traditional Female Vocalist of the Year, Traditional CD of the Year, Recorded Music Package of the Year and Artist of the Year – along with two nominations at the 2019 GRAMMY® Awards for Gospel Album of the Year and Gospel Performance/Song of the Year. For more info, visit www.myjekalyncarr.net. en Tankard has been bestowed with many titles and decorated with some of the highest honors in entertainment, arts, and music. He is a multiple GRAMMY®, Dove and Soul Train Award nominee with Gold and Platinum selling Gospel and Jazz albums. He has earned 15 Stellar Gospel Awards and was inducted into the Stellar Awards Honors Hall of Fame in 2018. With a music career spanning three decades, Ben has topped the Billboard Gospel and Jazz charts with each album – and now has landed at the top again. His single, "Rise" hit #2 recently on the Billboard Smooth Jazz National Airplay Chart. Ben's remake of Herb Alpert's iconic jazz hit features Marion Meadows on sax and is the first single from Ben's RISE album, which peaked at #13 on Billboard's Top Gospel Albums Chart. RISE, released on his Ben-Jamin Universal Music record label, features collaborations with Paul Jackson, Jr. on "More Rain", and with Kirk Whalum on "It's Working". The author, musician, producer, pilot, and Pastor of a thriving church near Nashville, Tennessee continues the poised ascension in his career and is now celebrating his first NAACP Image Award nomination for Outstanding Jazz Album. RISE is available online and in stores. Connect with Ben on social media @BenTankard. You can catch him on tour or add him to your favorite streaming playlist by logging on to www.BenTankard.org. wo-time Stellar Award nominated group, Tim Woodson & The Heirs of Harmony does it again with their new album entitled, The Truth. This group and gospel music are synonymous and they have lived up to the title of true Gospel psalmists since 1992. Tim Woodson, formerly of the three-time GRAMMY® Awardwinning group, The Mighty Clouds of Joy, reorganized this group in honor of his late father, Luke Woodson. The heart- wrenching, soul-stirring vocals of this multi-talented singing group are like fine-tuned instruments that pique the emotions and uplift the spirit. The Heirs lend a high-powered, energetic, yet smooth and inspirational style as showcased in their live appearances and recordings that do not disappoint. They have toured the United States and Europe extensively, sharing the platform with Gospel greats such as Shirley Caesar, Bishop TD Jakes, Karen Clark Sheard, Kim Burrell, The Blind Boys of Alabama, Donnie McClurkin, Fred Hammond, The Mighty Clouds of Joy, Lee Williams & The Spiritual QC's and Kirk Franklin. They have appeared on Bobby Jones Gospel Show and other network television programs. NOTE: Gospel USA Magazine thanks The 2019 Stellar Awards for including Publisher Cecil L. Brown on the Committee which helped select the 2019 Radio Announcer of the Year. It was truly an honor. repeated commercial airplay without a major label's backing are slim to none. Much of commercial s ta t i o n ' s p l a y l i s ts a r e dictated from on high by the central corporate office. othing can beat the instant widespread exposure that radio can offer, so it's no wonder artists are always asking, "How do I get played on the radio?" Getting your music played is still a daunting task, but with so many diversified outlets for music listening available today, artists have the ability to target a smaller, more realistically achievable niche market without having to spend big bucks on a large, corporate radio campaign. But, if money is no object, hire a radio promoter. Radio promoters are experts who have developed relationships with DJs and have the ear of program directors across the country. Despite the high price tag (usually between $1,500$6,000 for 3-12 weeks), hiring a radio promoter still cannot guarantee you any kind of tangible results. Your chances of success are part talent, part endurance, part hype, and part luck. However, if your music is really good, you will have a better chance of getting sustained and meaningful airplay with the assistance of a well-connected radio promoter. The term "radio" gets used in many different ways. Here is a list of all the different formats that get referenced as radio. Commercial Radio. These are the big powerful stations that line up on your AM/FM dial. Typically they are owned by large media groups and program their music playlists based off the Billboard charts. College/Non-profit Radio. Usually completely independent entities where DJ's create playlists with music they love. Community Radio. Similar to the college radio station, but with an extremely local flavor. Satellite Radio. Sirius and XM are two satellite radio providers of note. Internet Radio and Podcasts. Pandora (with an estimated 50 million users worldwide) is a standout in this bunch, but there are numerous other worthy contenders who broadcast completely online. "Change My Heart" by Bill Moss, Jr.
(of Detroit, Michigan) (Salathiel Records) 586-634-5639 Re-Enter)5. Procedure for critiquing products: A score of 1 to 10 points are awarded in each of 10 ratings categories, including sound quality, originality, talent, air play received, national charting elsewhere, marketing and even the design of the CD cover. The points are totaled and the 30 songs which receive the most points are listed numerically on the chart. There is a one-time service fee of only $75 to have a song critiqued by us, but paying the fee does not guarantee the song will make the chart. Making the chart is achieved solely on the merits of the song itself. To submit your song for chart consideration -- call 305-234-8689. ...America's LONGEST-RUNNING Gospel Music and News Magazine! eacon George Dawson, Jr. was born in Cairo, GA on April 17th, 1938. In 1953, he relocated to Coconut Grove (Miami), Florida and began looking for opportunities to share his vocal talent. At age 17, he began singing with a fast-rising local gospel group called, The C Lord C's. The group soon became one of the most popular gospel groups to come out of Miami. George sang with The C Lord C's for 60+ years. During the latter years of his life, George was employed with A.J. Manuel Funeral Home in Hollywood and Florida City, Florida (954-920-1313 and 305-246-5005) for 15 years. Deacon George Dawson, Jr. transitioned from this life on June 8th, 2016. The C Lord C's were formed in 1954. Over the years, the members have included Charlie Davis (founder / 305-621-7427), Herbert Butler (mgr), George Dawson, Dan Pendergrass, Robert Curry, James Washington, Fred Washington, Sylvester Dukes, Cleveland Morrow, Thomas Day, Claxton Jordan, Ernest Jenkins, Nelson Range, Delores McCall and Joe Washington. The group has performed with numerous gospel legends including The Swanee Quintet, The Mighty Clouds of Joy, The Soul Stirrers, The Supreme Angels, The Five Singing Stars, The Original Gospel Keynotes, Shirley Caesar, Dorothy Norwood, Doc McKenzie, The Canton Spirituals, The Consolers, Gene Cross & The Smiling Jubilaires and Rev. James Lowe â&#x20AC;&#x201C; among many others. Watch for a new website coming soon where everyone can sample and purchase classic recordings by The C Lord C's, see photos and find out more about them. Look for www.GeorgeDawsonTribute.com. classifiedads... RAISE FUNDS FOR YOUR GROUP/YOURSELF Youth groups, gospel groups, churches and individuals across the USA who want to raise funds for a special project, or to just increase their own income can sell copies of Gospel USA at your church, to your friends or at other locations in your city. For information, call 305-234-8689. June 14th - 18th, 2019: Gospel USA Magazine's 7th Annual Gospel Fellowship Cruise & Retreat travels to Freeport, Grand Bahama. Join Publisher Cecil L. Brown along with independent gospel groups, artists and fans from across the USA for a full weekend of music, ministry, fellowship and fun! For itinerary, rates and more details, see ad on page 5 and visit www.GospelFellowshipRetreat.com or call 305-234-8689. June 22nd, 2019: Gospel SuperFest 2019 will be held at the Schuster Performing Arts Center, 1 W Ludlow Street, Dayton, OH 45402. Sponsored by African pride, the event features Jonathan Nelson, Donnie McClurkin, Rance Allen Group, Deitrick Haddon, Tina Campbell, Tye Tribbett, Ricky Dillard, Byron Cage, Sensere and many others. For details and tickets, visit www.ticketcenterstage.com or call 937-228-3630. July 2nd - 4th, 2019: The 2019 Full Gospel Baptist Church Fellowship International Conference will be held at the Gaylord Opryland, 2800 Opryland Drive, Nashville, TN 37214. Guest speakers include Presiding Bishop Joseph Walker. Visit www.fullgospelconference.org. July 4th - 8th, 2019: The 1st Synergy In Dance Festival is tentatively scheduled to be held in the Caribbean Island of Barbados. For details as they become available, visit www.GospelEventsOnline.com. July 18th - 21st, 2019: The 11th Annual Rhythm of Gospel Music Awards will be held in Baton Rouge, LA. The host hotel is the Hilton Capital Hotel, 201 Lafayette Street. For the 2019 nominees, itinerary, performing artists and more, visit www.therhythmofgospelawards.com or call Dr. Mark Rogers at 210-745-5858 ext. 109. July 27th - August 2nd, 2019: The 52nd Annual Convention of the Gospel Music Workshop of America, Inc. will be held in Washington, DC. Host hotel is the Washington Hilton. For registration forms, area hotels, itinerary and more details, visit www.gmwanational.net. October 1st, 2019: Gospel USA Magazine will release its next Gospel music compilation CD entitled, Artists Favorites, Volume 27. For information on how to have your original Gospel song included on this popular CD series, call Cecil Brown at 305-234-8689. TELEVISION BROADCASTING OPPORTUNITY Glory To God TV (seen over the air on Charter/ Spectrum cable channel 181 in Georgia and parts of Alabama, as well as 24-hours online streaming) has great opportunities for TV exposure for your church, music ministry or business. For details, visit www.glorytogodtv.com. PRODUCT SERVICE REQUESTED Ray Manning Singers Internet radio station has prime program slots available for churches, ministries, artists and businesses. Call Ray or Raymond Manning at 816-255-2473 for product submission information and be sure to listen 24/7 at www.raymanningsingers.com. PRODUCT SERVICE REQUESTED Gospel artist/radio personality Lady Voncile Belcher is accepting gospel music submissions for radio airplay consideration on her popular show, The Indie Artist Mix with Lady Voncile Belcher. For submission details, send email to singvoncile@gmail.com, search for her on Facebook.com or call 678-994-1663. PRODUCT SERVICE REQUESTED Artists looking for airplay consideration should contact Evg. Terri 24Kt Gold, PD, at WESL AM 1490, Praizze Digital Radio, 10920 Schuetz Road, Suite 1, Saint Louis, MO 63146. Listen 24/7 at www.weslradio.com. Global streaming. Phone 314-436-7424. Chuck Spearman is GM. Calendar and Classified ad rates: $50 for up to 40 words. Additional words are 20cents each. A word is 2-12 characters. To place your calendar of events or classified ad in the next issue, call 305-234-8689. The advertising deadline for our July Sept 2019 issue is June 22nd, 2019, if ad space is still available. The issue will be distributed nationally by direct give-aways at select popular events, by postal mail to our subscribers, and to key gospel industry personnel across the USA (including radio programmers, TV & video show hosts, concert promoters, gospel award shows, conferences, record labels, artists, churches and media) and globally via our website. To advertise, call 305-234-8689. Here’s where to reach your favorite Gospel music industry sources via the Internet. To advertise your web site here and stay in front of key decision makers and fans, call 305-234-8689. What Is An ISRC Code – And Why Do You Need It? n International Standard Recording Code (ISRC) is a 12digit alphanumeric code that can be permanently encoded into a sound recording or music video as its digital fingerprint. An ISRC enables your product to be automatically identified when it is performed internationally. ISRCs are used globally in digital commerce by download sites and collecting societies for rights administration, royalty payments, music tracking and more. An ISRC is required by most digital distribution companies and download sites in order to sell your content online. clients or customers. ISRC Managers, such as CDBaby.com and others, can provide individual ISRCs to independent artists or to those who do not wish to manage their own ISRC assignment. ISRCs are issued as a part of the business arrangement between the company and an artist. Regardless of how your ISRCs are obtained, you will be able to use them for the life of the recording. There is no distinction between ISRCs issued by ISRC Managers and those issued using your own Registrant Code. Remember... ISRC codes are to the digital world what the UPC code is to the retail world. To become an ISRC Registrant or an ISRC Manager, visit www.usisrc.org. Attention authors: To have your recently released or soon-tobe released book listed here, call us at 305-234-8689 for rates. "Power For Living" by T.D. Jakes. How often have you cried out to God, why? Why do I struggle? Why do I have problems? Why don't people understand me? The answer: Because you are anointed! Author T.D. Jakes writes, "I used to have the wrong notion that when you are really anointed, you no longer have problems or rough times. But you show me anybody who's really Holy Ghost anointed, and I'll show you somebody who cried in the middle of the night and suffered all night long, wondering where is God." This book will help you discover how to be victorious in those times – and in life. ISBN: 9780768428384. Price: $29.99. To order, visit www.TDJakes.org. "What You Say When You Say 'I Do'" by Derek Triplett. It takes less than 3 minutes to exchange marriage vows and less than 90 seconds for each individual to make a series of lifetime promises that most likely are not fully comprehended. What's more, most couples have not equipped themselves to fulfill all of the promises they make. Derek Triplett uses humor, real-life experience, and professional analysis to explore the subject. This book will revolutionize your view on the subject. Available at Amazon and Barnes and Noble. For interviews, booking and more, contact info@derektriplett.com. "Courage To Win" by Denise C. Johnson. This book was written to encourage women to continue to push, pursue and believe God for victory in every area of their lives. This is one woman's (the author's) story of overcoming some of life's greatest challenges. "Through it all God gave me the Courage to Win." The book is available at Amazon.com and other popular outlets. ISBN: 978-1-4984-4263-3. For review copies and interviews, contact wjohnson@orlandofaith.com or (407) 291-2030. "You Are An Overcomer" by Dr. Carl Bentley, pastor of 26 years. This Charismatic guide to Christian spiritual disciplines (274 pages) covers topics such as healing, how shouting causes Satan to loose your circumstances, musical ministry to the Lord, warfare by the gifts of the Holy Spirit, engrafting God's Word into your heart, winning the war of the flesh by fasting, and tongues as an indicator of Holy Spirit infilling. A model prayer and a bibliography for worship and spiritual warfare is provided. A good resource for growing Christians and also for pastors. ISBN: 978 0 88144 258 8. www.carlbentleyministries.org. "Deliver Us From Evil" by Deryl S. Lampkin. At the root of hurting relationships are misinformation, misunderstandings and mistrust. Deliver Us From Evil reveals life-changing principles to fix your relationships with your spouse, God and others. The lust of honey and the love of money has destroyed countless relationships because men want to get laid and women want to get paid. These powerful truths can refresh your relationships and bring you joy. A must-have resource guide for conquering evil. Publication date: 11/4/14. ISBN/EAN13: 1942325010 / 9781942325017. 154 pages. To order, visit www.deryllampkin.com. Interviews: dslpotent@hotmail.com. "The Mystery Of The Final Resurrection" by Robert L. Tatum, Jr.. If you have ever wondered about the END of DAYS, this book is a mustread! Writing this book has been one of the most challenging stages of my Christian walk. This book is going to change lives and challenge God's people to go deeper in the Word, and others who do not believe to be challenged by what they believe. If you are confused, afraid, or dismayed by the book of Revelation, you must read this book! The antichrist, the false prophet, the beast, the woman, 666 – all are revealed in this mystery. For pre-orders, interviews and more information, contact 903-422-9382 or send email to fullyarmouredministries8@gmail.com. "Can I Trust You?" by Bishop Huden S. Roberts. It has been said that the richest place on earth is the cemetery. This statement is true because most of us never really reach our true potential in life. This book speaks very clearly about how you ought to make the time to study and develop your God-given gifts and talents – then share them with the world. Most of our time is spent wondering if we can trust God, but in this God-mandated book, God asks you... "Can I trust YOU? Read this book and begin to discover true life – the God kind of life. Available at Amazon.com (search for Bishop Huden Roberts). For interviews and bookings, write to bishoproberts242@gmail.com. Congratulations to Lady Beatrice Ward & Angelic Voices for being inducted into the 2018 Rhythm of Gospel Living Legend Hall Of Fame on June 21, 2018. For 2019, the group is nominated for SIX Rhythm of Gospel Awards. They are: Traditional CD; Quartet CD; Product Packaging; Traditional Female Vocalist; Quartet Group; and Female Quartet/Mixed Group Of The Year. The group is also scheduled to be a headliner at the 2019 ROG Awards. The Houston, TX-based group was formed in 1982 and recently celebrated their 37th Year In Ministry on March 24th, 2019. They have won numerous awards and traveled extensively. In 2018, they released their latest full-length album entitled, Lord Help Me. For bookings, radio service and more info, contact Lady Bea at (832) 283-2087 or visit www.ladybeaangelicvoices.com. The Gospel Soul Winners were formed in 2017 in New Bern, NC. The members are Charles McDaniel, To m m y G r e e n , R y a n Yo u n g , Samuel Dawson and Tony Mallord. The producer of the project is Rev. Reginald Midgette, Jr.. Each member is an anointed vessel in the hand of the Lord. Their debut single is entitled, "Nobody's Fault But Mine." This song is a member's true testimony and it is available on CDBaby.com and other digital outlets. Also, search for and watch their new video on Youtube.com. For radio copies and booking, call Samuel Dawson at 910-934-1950 or email samdawson197@yahoo.com.